This one has been building for weeks. 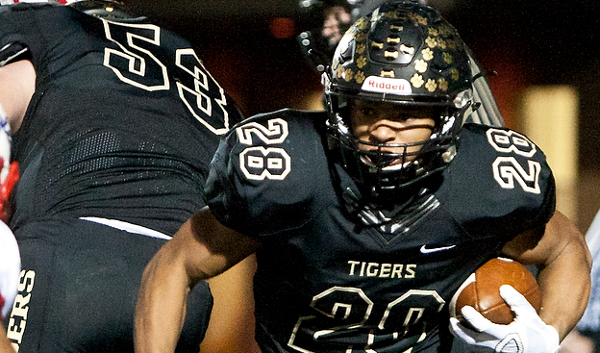 The two top teams on the eastern half of Class 6A all season will meet as the second-ranked Blue Valley Tigers will host No. 3 Shawnee Mission East Lancers for a chance to play for the state title. The Tigers and Lancers have combined to represent the east in each of the last three 6A title games. Shawnee Mission East reached the title game for the first time in 2013 when the Lancers fell 28-21 to Derby. East returned in 2014 and captured their first state title in a 33-14 win over Hutchinson. This season the Lancers have won eight straight games since a 26-20 loss to Rockhurst (Mo.) back in Week 3. In that loss, the Lancers dominated the game in every phase but turnovers. Since, the Lancers have won by an average margin of 51 to 18. Shawnee Mission East needed a late Milton Braasch touchdown and two-point conversion to win their second-round game 36-35 over Gardner-Edgerton. Last week the Lancers scored three consecutive touchdowns to turn a 14-12 lead into a 34-12 lead against Shawnee Mission North. It was again Braasch, the Lancers’ leading rusher, who ignited the offense with four rushing scores. Shawnee Mission East is a veteran group with talented quarterback Luke Kaiser, speedy back Nigil Houston, and receivers Trevor Thompson and Sky Tate. Justin Finnigan leads an experienced group up front for the Lancers. Blue Valley is trying to get back to the 6A title game for the second consecutive season as the Tigers lost to Derby 27-14 last fall. The Tigers made an impressive undefeated run through the Eastern Kansas League including a 35-28 win over 4A-I No. 1 Bishop Miege to open the season. Blue Valley also has wins over 5A semifinalists Mill Valley (45-28) and St. Thomas Aquinas (45-34). Senior quarterback Matthew Dercher has passed for 2,717 yards and 30 touchdowns with only four interceptions. The Tigers’ group of receivers is one of the team’s strengths. Five different Tiger receivers have more than 20 receptions with four having more than 300 receiving yards. Senior Harrison Van Dyne has 52 receptions for 927 yards and 10 touchdowns, while Cade Green has 37 catches for 645 yards and six scores. Senior Gus Gomez has returned to catch 24 passes for 373 yards and six touchdowns in only seven games. Williams Evans has been a handful running the football for Blue Valley. The senior has 1,361 rushing yards and 21 touchdowns including 482 yards and nine scores in the Tigers’ three playoff games. The Blue Valley defense surrenders only 15 points per game and is led by senior linebacker Michael Maffry and his 148 tackles. Classmate Ashkon Saravi has 129 stops, while Zach Gill has 104. These are two great teams well deserving of a trip to Welch Stadium in Emporia next week. The game may ultimately be decided by turnovers, and perhaps a small home-field advantage for the Tigers. This is a rematch from the Class 6A sub-state title game last season when Derby won, 35-14, at home. The Panthers then defeated Blue Valley, 27-14, to win the state title the following week. Last Friday, Derby rolled over Hutchinson, 40-7, and beat the Salthawks for the second time this season after a 46-20 road win in Week 4. The Panthers now own the longest current winning streak in Kansas at 21 straight. Derby scored 27 points in the first quarter against Hutchinson. Dan Dawdy threw for 361 yards on 17 of 25 passing, including scores to Kai Lemons, Kenyon Tabor and Michael Littleton. Free State has never won a state title since the school formed in 1997, but the Firebirds have made the semifinals the last three seasons and four of the past five. The Firebirds defeated Washburn Rural, 17-14, last week at home. Free State’s Kameron Lake kicked a 40-yard field goal with 2:03 left for the winning points. The Firebird defense again was terrific and limited Rural to 73 total yards and three turnovers. Free State didn’t allow an offensive touchdown. Zion Bowlin ran for 160 yards to lead Free State. Dallas Crittenden, in his first season at Free State after he transferred from Topeka Hayden, broke the Firebirds’ single season passing record previously held by Ryan Murphy in 2006. Crittenden has thrown for 1,902 yards. The Firebirds have won eight straight with an average score of 38-9. Derby, in its last eight games, has permitted 11.4 points a contest but scored 52 a game. Since the ’14 playoffs, Free State is 3-1 at home and 3-1 on the road after Week 9. The Firebirds have won at Junction City, Wichita Northwest and Garden City the last three seasons by an average score of 44-19. The lone road defeat is to Derby. In the last two seasons, the Panthers are 23-1. Derby has had more trouble with non-Wichita/Hutchinson area schools than with teams they usually plays in their local area. In that span, Derby is 19-0 versus area schools with an average score of 52-14. The Panthers are 4-1 versus other non-area teams with an average margin of 36-21. Derby’s fewest points in the 19 area wins came in a 35-6 victory versus Goddard this season, a game called at halftime because of weather – and the Lions’ lone loss of the year. In the five other contests, Derby has scored 20, 35, and 27 points in three of the games. Free State gives the Panthers its closest contest of the season and keeps Derby’s points down, but the Panthers are just too strong.